Sensation Scarlet is a magenta jelly packed with magenta and silver fine glitters with a slightly chunkier silver holographic glitter. This reminds me of the China Glaze glitters from last fall. The required a few coats of top coat to smooth out the grittiness. This is my favorite of the 3 I bought. This is Such A Go-Glitter layered over Ulta3 Hollywood. This a clear base glitter top coat with bright blue, gold, and silver littler holographic glitters. I don't think I made a good choice when layering it over this blue. 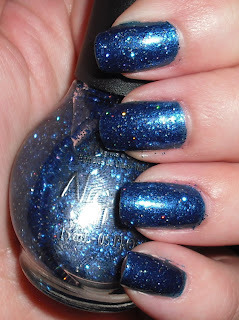 The blue glitter was an exact match for the polish so it blends right into the nail. I actually really like how it looks but you can't see the blue glitter! This is Pitch-Black Glimmer layered over WnW Black Creme. 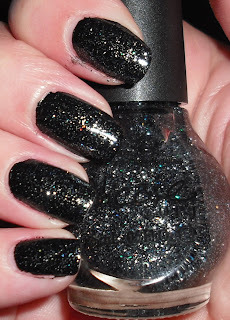 It is a clear based glitter top coat packed with black,silver, and holographic glitters. This reminds me of Revlon glitter Galaxy minus the hexagonal glitters. I prefer this one the glitter is more compact and shows off better on the nail. Overall, I really love these glitters. I was disappointed that Such A Go-Glitter and Pitch-Black Glimmer were glitter top coats rather than jam packed jelly-glitters, but performance wise I really do like them. These were $7.04 each which puts them high on the price for what I normally buy. I think if I was going in with my own money I would only purchased one or two of these on separate occasions to spread the money out! My favorites are definitely Sensational Scarlet and Pitch-Black Glimmer. I love how Such A Go-Glitter looks in the bottle, but I think I'd try to layer it over a different blue or even black because the glitter blended into the blue I used. I don't want to unfairly judge it! These are Target fall exclusives so if these look interesting to you, it's a a good idea to pick them up because they won't be there forever! oo la la, that scarlet is breath-taking for a drugstore polish, eh? wow, love the Magenta and Blue ones! i just got the red & blue ones and can't wait to wear them! OMG that red is to die for!!! LOVE!!! I'm overjoyed that glitter isn't just for Christmas anymore. Yeaaaahhhh!!! I think the Scarlet is my favorite too! Love these and next time I am in Target I will be heading to the nail polish to look for them. Hope I typed this right since the hubby gave me a rum and coke tonight and I am a weaksauce. Trust me though I will remember this polish! I'm biased with the color red! 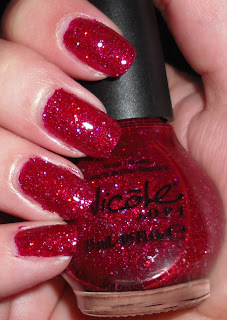 I love the glitter and shine of the scarlet!!! score! Thank you, I bought the blue, black and the last red on the shelf here that someone had tucked behind other colors. Hm nice Colors and a great Glittereffect - fine.